The blade was made at 1852, August lucky day age 73 years. Blade length is 75.1cm. Written by Tanobe. Habaki :gold wrapp and silver double habaki. Blade length :　75.1cm or 29.56 inches. Width at the hamachi : 2.80 cm or 1.10 inches. Width at the Kissaki : 1.75 cm or 0.68 inches. Kasane : 0.64 cm or 0.25 inches. which looks like typical Nanbokucyo style. Jigane :Itame had and mokume had mixed with jinie attach and nagger massage. Hamon :Niedeki suguha based and small gunome midair mixed. active ashi, yo and ash sactter and also sunagashi, kinsuji work. and become a pupil of Suishinshi Masahide. 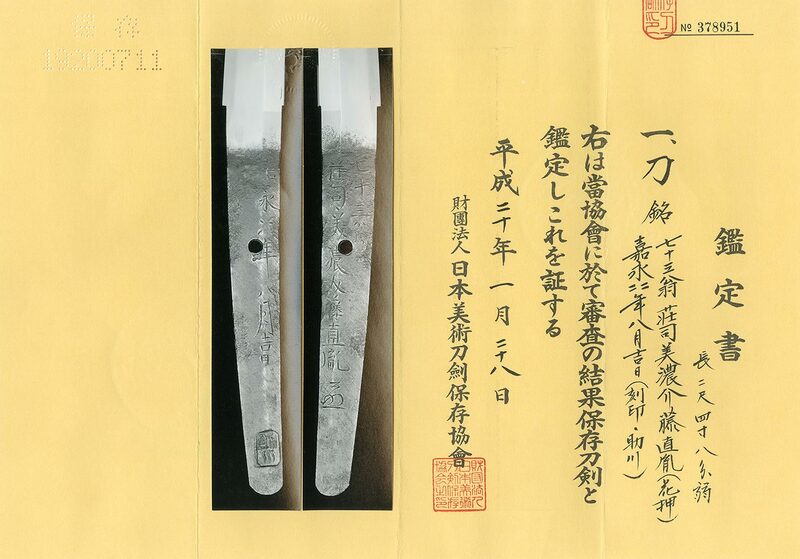 The Akimoto family in Yamagata province retained Naotane around 1812.
he got many invitations to forge sword in various places. He added the name of place to inscribe the signature. Naotane passed away in 1857, aged 79. Yamashiro-den and Yamato-den. He was good at Bizen-den and Soshu-den in particular. in the last days of the Tokugawa shogunate. Tsuba:On the round shape iron stub, some design is engraved open work. rice stalk is engraved with gold color. and kogunome midair hamon. and it is necessary to return old fashion style sword. Naotane was a student of the Masahide, so He also agreed to make simple strong kogunome midare hamon. This sword is old style Kagemitsu utsuishi. Boshi is typical sansaku Boshi(noter and round shape) which looks typical Kagemitsu. The Jigaane is very attractive. and also Hamon. Aoi Art estimation paper : NBTHK hozon paper.